Network Asset Tracker Pro Special Edition (SE)* is a network inventory solution that enables you to scan all the nodes of your network with just one click. Get complete information about operating system, service packs, hotfixes, hardware and software on remote PCs. Powerful reporting module helps you save a lot of time for preparing asset reports. * Special Edition (SE) has no ability to get remote screenshot and doesn't have the access to the remote processes. You can get information from remote PC through WMI (agentless method) or, if you have any problems with WMI, you can use "NAT Pro - Agent" installed on remote PC (agent-based method). Network Asset Tracker Pro SE automatically detects if "NAT Pro - Agent" is installed on remote computer. Also you can scan remote computers using logon script. You can track changes in inventory data using history of scans. Examples of reports in HTML format: List-style report, Sheet-style report. Hardware requirements: no special requirements. On the left side of main window you can see a list of computers, along with host name, IP-address and the date when information was last updated. You can organize your computers by groups (folders). For this you can use drag and drop. - folder with computers or folders (for example, it might be department or room). - computer is on-line and "NAT Pro - Agent" detected. - network device is off-line. - network device is on-line. When you first start the program you need to add computers of your network to the list. 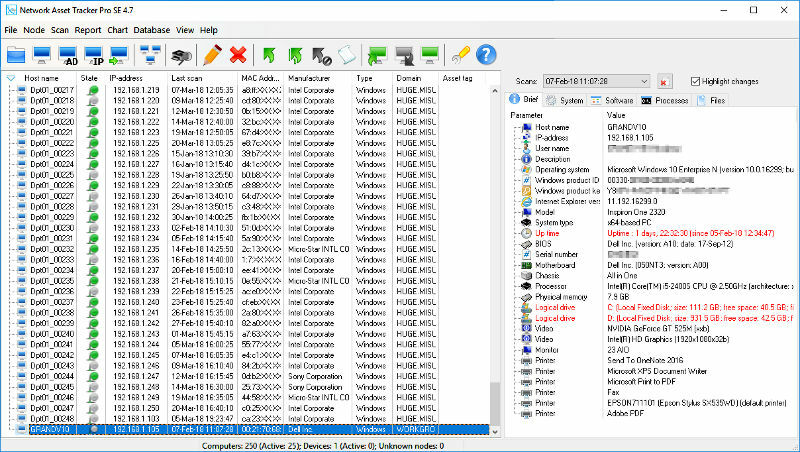 Network Asset Tracker Pro enables you to scan all available computers on your network with just one click. Sometimes you need to scan available computers within a particular range of IP addresses. Just provide the starting address, the last IP address and Network Asset Tracker Pro will scan all available computers between that range of IP addresses. To add computers manually you should click "Add Computer by Host Name" button from the toolbar or press "Ctrl+N". Then type a host name of the computer and click "Ok" button. To delete computers or folders press "Del" key or select menu "Computer" -> "Delete". Then selected folders and computers will be deleted from the list. You can get information from remote computer through WMI (agentless method) or through "NAT Pro - Agent" (agent-based method). 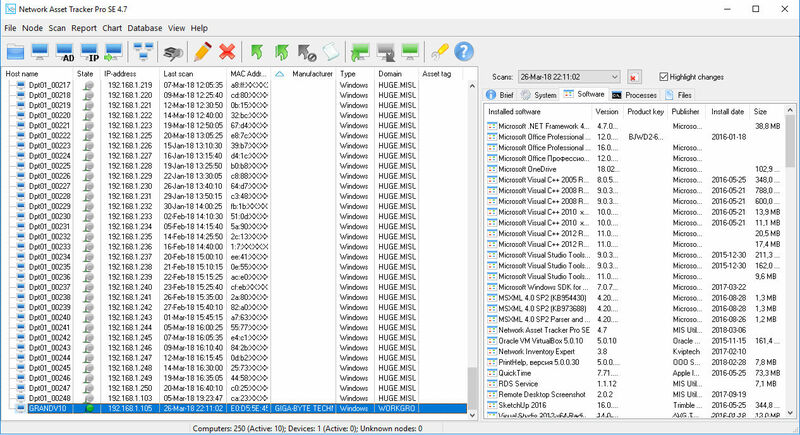 By default Network Asset Tracker Pro uses WMI. To use agent-based scan you should install "NAT Pro - Agent" on remote PC. Network Asset Tracker Pro automatically detects if "NAT Pro - Agent" is installed on remote computer. Just select computers you want to scan and click "Get Info" button from the toolbar or press "Ctrl+I". This will start scanning remote computers. You can set up the type of information collected from remote computers. To do this select menu "File" -> "Options", then "Scan Properties". 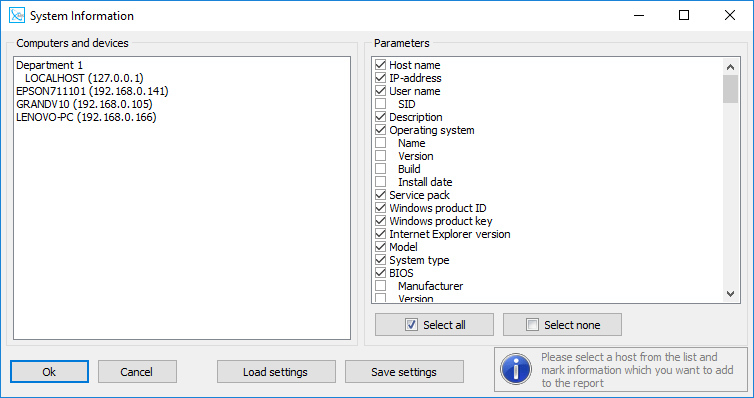 If you have any problems with WMI, you can use agent installed on remote PC. You can install "NAT Pro - Agent" from main Network Asset Tracker Pro installation package. 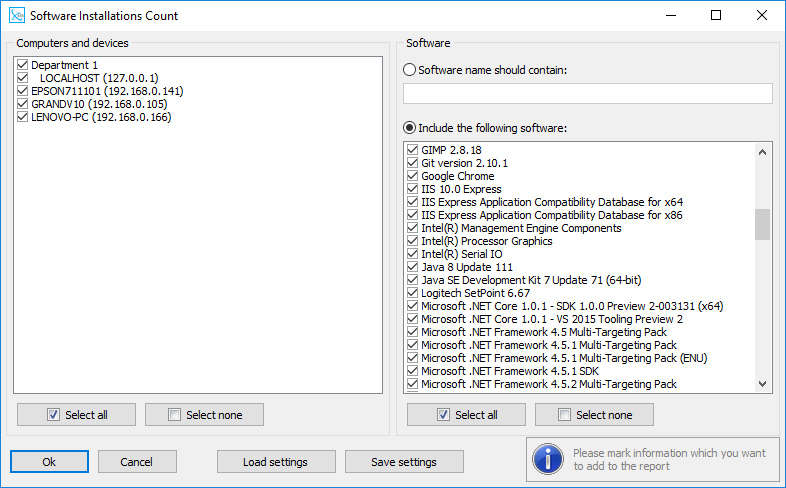 Also you can download "NAT Pro - Agent" as a standalone installation package. You can download a standard EXE-package or download a MSI-package for remote deploying through Active Directory. - green color of computer's icon shows that "NAT Pro - Agent" is detected. You can set up some options of agent installed on remote PC. To do this select menu "Computer" -> "Remote Agent Information". By default the icon of "NAT Pro - Agent" is visible in system tray on remote computer. You can hide this icon from system tray. To do this select "Hide tray icon" option in "Remote Agent Information" window. To use logon script select menu "File" -> "Options", then select "Scan Using Logon Script". All you need is to set up shared folder where an inventory tool natagent.exe will be placed and shared folder where resulting files will be saved. You can use custom columns for storing your custom information, for example serial number, phone number, etc... To edit data in custom column click "Edit Custom Column" button from the toolbar or click twice on custom data you want to edit. 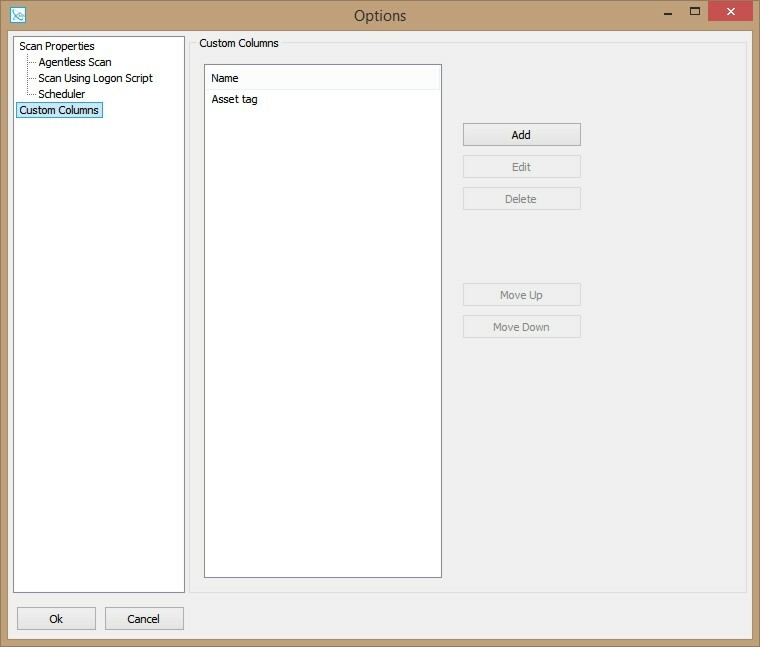 To manage custom columns select menu "File" -> "Options". Then select "Custom Columns". 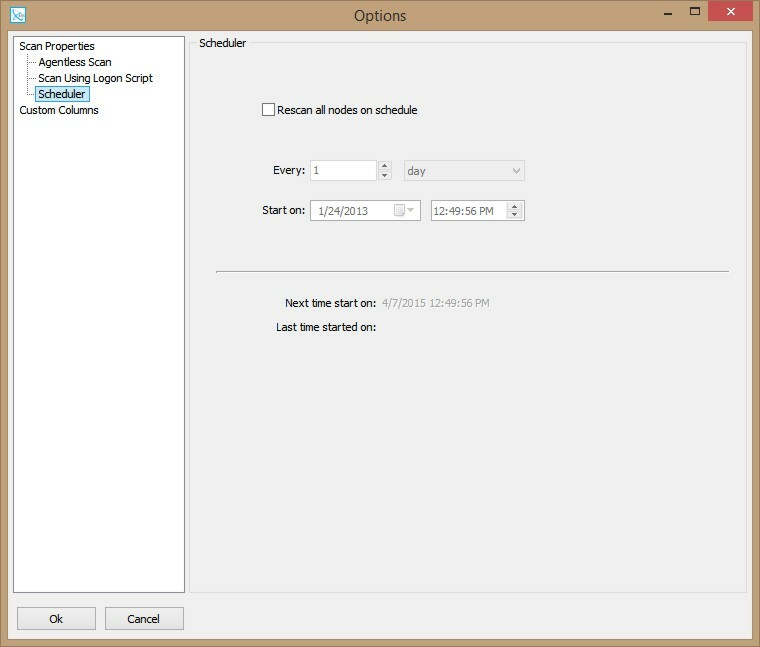 In the window "Options" you can add, delete or move custom columns up or down.